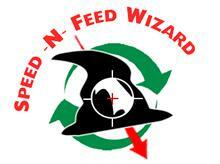 The Sawblade.com bandsaw speed and feed wizard uses standard industry calculations to not only estimate cutting times for different metals and alloys, but also to provide you with recommendations for band saw blade tooth pitch for your application. This wizard is provided as a starting point only, it is not the end all, be all, for cutting. There are many factors above and beyond the calculations that will determine your actual cutting speed and feed pressure. Factors such as your machine, its horsepower, its feed system, whether it cuts guillotine style (horizontal/vertical), pivot style, or canted. Lubrication also affects cutting times. Since there is no way we can account for all factors, we are sticking to the basics; we try our best to get you started, but your common sense, experience, and results should determine your final settings. 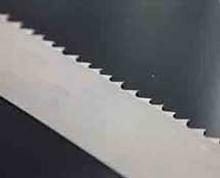 A saw blade's speed is defined as the distance in feet that the blade travels per minute: a measurement of S.F.P. M. or Surface Feet Per Minute. In order to achieve proper blade speed, the SFPM must be optimum for the application. The drive belts cannot be slipping under the load being machined, and the tachometer needs to be checked often in order to assure that the proper RPMs are being maintained. Cutting Rates shown are estimated cutting rates. Variables such as machine make, machine model, and tooth geometry	(wider blades) will allow for faster feed rates and longer band saw blade life. Poor machine condition or design will impact performance negatively. Cutting rates are for customer reference and are not guaranteed by Qsaw or sawblade.com. Stock is assumed to be solid throughout cutting area. Please select the correct shape to be cut. Use common sense when using recommended rates. If the blade is loud or cutting crooked, adjust feeds	and speeds to eliminate the issue.